This is a photograph of the remains of Fleetwing that I took in 1982. The deck had gone, and they were using the hull as a dump for empty 40 gallon oil drums. I did get aboard though. You’re a very lucky man to have been aboard. There is a small piece of her in the local museum but no more than a 12”x12” block of wood. Really appreciate you sharing those pictures. Thank you. This is the inside of the Fleetwing. They had cut the stern down to the waterline, and removed or broken off the clipper bow. There were a few spars lying about as well. I boarded all the wrecks I could, including iron barque Lady Elizabeth, barque Jhelum, Yankee clipper Snowsquall, American barque Jennie S Barker at Grytviken, South Georgia, Canadian barque Egeria. Got close to American packet ship Charles Cooper, but couldn't board her, also saw barques Capricorn, William Shand, Margaret and Actaeon. We didn't go to Goose Green, so I missed out on the Vicar of Bray. Neither did we go to Leith, South Georgia, where the British full-rigged ship Sierra Pedrosa was beached. Our Welsh ship's surgeon, John Jones, gave me the book Porthmadog Ships by Emrys Hughes and Aled Eames, and I later purchased Immortal Sails by Henry Hughes. John managed to get appointed to my ship at Ascension Island for one relieving voyage, just to get down to Port Stanly and see the Fleetwing. But the day after he joined, we got demobbed, and sent home to the UK, so he missed out. 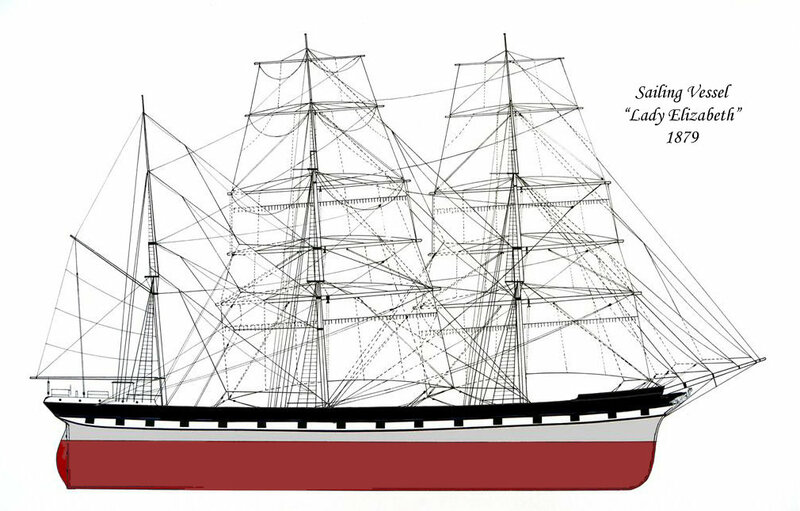 I drew up the plan using dimesnions etc from the Lloyds Register and the two known paintings of the ship. I never realised there were so many wrecks/abandoned vessels down there. I would have thought they would have had the wood removed and re-purposed long ago. 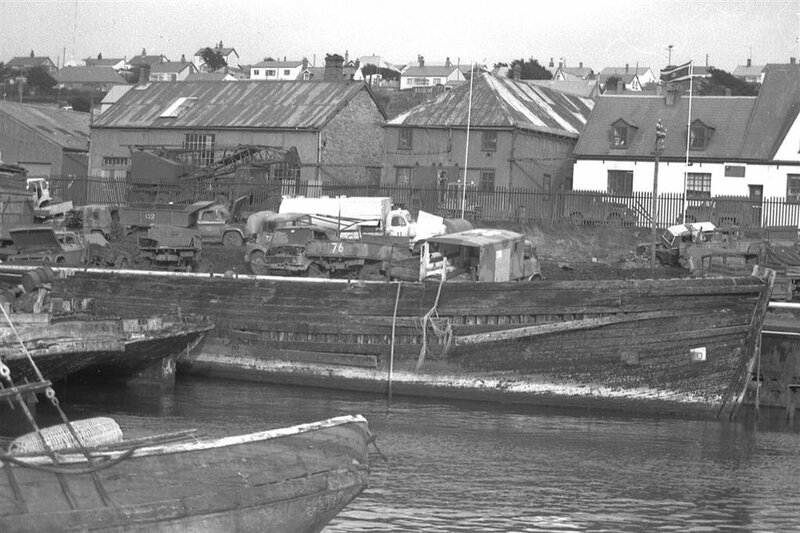 After they were condemned at Stanley, usually after getting damaged off Cape Horn, most of them still had many years service ahead of them as storage hulks. As they actually had owners, no-one was free to take anything off them! In 1982, the hulk of the Egeria was still in use, although only the after part remained! The Fleetwing was the only one that arrive undamaged. She was purchased for inter-island use, and therefore arrived intact, and was used for a number of years. There were plenty more hulks around, but the above-mentioned ones were the only ones I managed to see. Actually, my first thought when I volunteered to go down there was that I would see the wrecks, something that I had always wanted to do ever since I was at school. As we sailed into Stanley on a freezing cold morning, I think that the eyes of everyone aboard, except me. was glued on the Task Force ships, and general activity in the harbour, but I was looking in the other direction, at the hulk of the iron barqe Lady Elizabeth (Completed 1879) at the other end of the harbour. Didn't take me long to get aboard, meaure things up, and take some photographs. Even got down ito the tween deck, but couldn't go any lower, because the lower hold was flooded as the ship was aground. I see it's an old thread. Last post a year ago, but the nubs, we can look around and post our other passions, right? Some familiar names, some not so familar. Some sticking with ships, others not. I am an amateur astronomer. Have been since interested in the heavens above since I was 12. 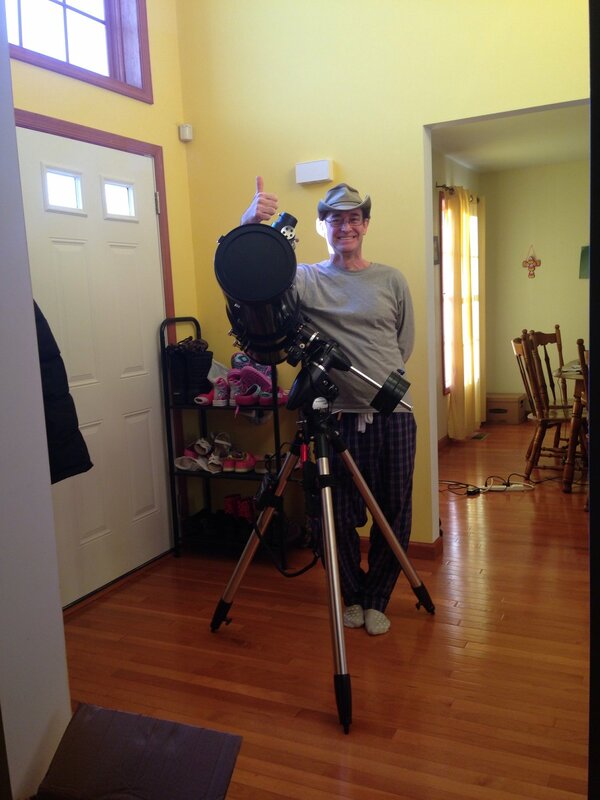 I have owned a few telescopes. I am now on my 3rd. I also am a citizen scientist/astronomer and have worked on projects for The University of Toronto. Namely, the Search for Planet #9, the Search for Exoplanets (0ver 1400 discovered by the team), and currently classifying galaxies, into like groups, sorting and such, and pointing out things of interest we might want to point the telescopes back on. Most of the photos were taken by Hubble. We were tasked by NASA because in all 3 cases it was too much work. So HQ reports back our findings after verifing. you remind me of my brother-in-law. He is on his third telescope as well. It’s quite the beast. He has a van that he hauls it around in and he has to put it together as it comes in sections. Once I tried to ask him how much he paid for it and he declined to say so I am assuming it’s a small fortune. We were out one night years ago and we could see the rings around Saturn. Very cool to see God’s creativity up close. Yeah Jeff, my next big feat is to put a camera on it. I have the mount. I know 2 blokes that do astrophotography with this model. They are very helpful with equipment add-ons. Processing is quite complex and lengthy. The software is "shareware?" I'm told. For now, enjoying visual. Watching a Supernova developing in a galaxy 300 million light years away, 100 million across, (per Wikipedia) in the last few weeks, with this telescope.